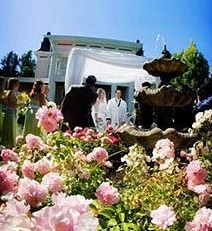 Wedding ceremonies most often take place on Churchill Manor’s expansive lawns facing either the rose-bordered fountain or the front entry of the mansion. The spacious veranda and ornate parlors are perfect for socializing with hors d’oeuvres and champagne following the ceremony, the inner parlors for presentation of the gourmet buffet, and the side lawn for alfresco dining. During dinner, the veranda becomes the stage for momentous toasts and light-hearted cake-cutting, with the inner parlors made available for evening dancing to DJ’s and small bands. 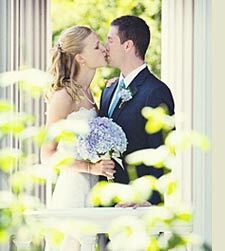 For a print-friendly version of our 7-page Weddings and Buffet Receptions at Churchill Manor brochure, click here.